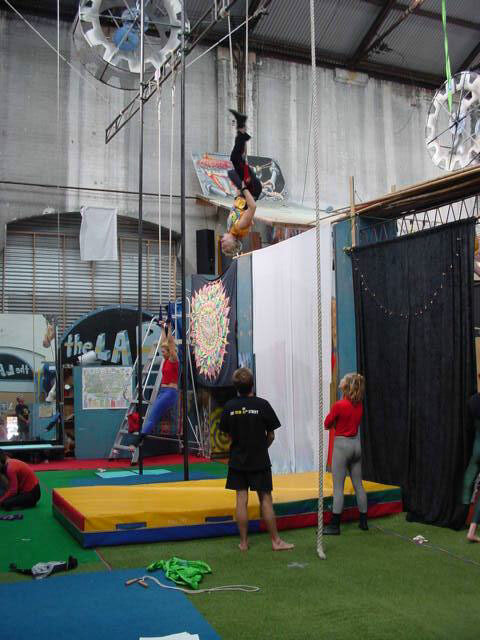 The Lab is a well known centrally located circus and aerial training space for professionals in the industry [performers and trainers], and individuals/groups seeking instruction. The Lab's principal design has been to allow anyone access to develop skills in a hybrid creative way and to do so in a fully equipped space with complete safety. As a collective working towards a common goal, The Lab have been able to call on a vast pool of resources to administer and fit the space out with high quality and innovative equipment. CircusWorks have been in residence at the Wilson Street Carraigeworks since July 1999. 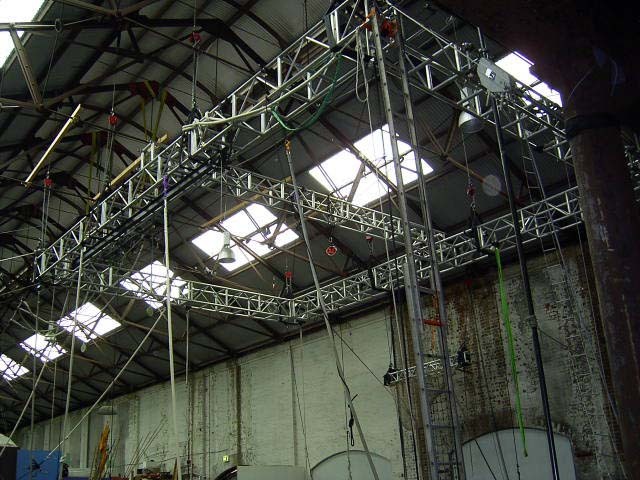 In collaboration with Gavin Wild, a leading Australian physical theatre - rigging engineer, they have helped develop The Lab as Sydney`s premier circus and aerial training space. In the lead up to The Sydney 2000 Olympic Games and 2000 Paralympic Games, The Lab was used everyday by many groups involved in the Olympic Art Festival and Live Sites events, and many individuals training for the Opening and Closing Ceremonies for both The Sydney 2000 Olympic Games and 2000 Paralympic Games. Since the Olympics, The Lab has expanded to accommodate for increased demand and has established itself as a going concern. Over 120 individuals, groups, schools and art industry professionals have accessed the space over all there have been around 1500 visits since April 2000. 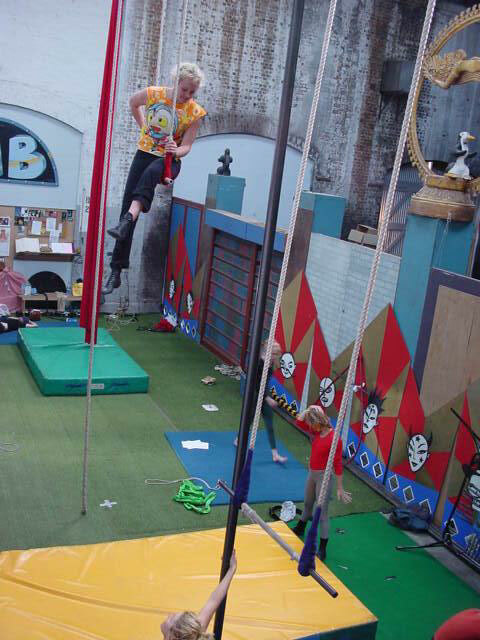 At present The Lab training facilities include swinging trapeze and cloud swing Static trapeze and cloud swing counterweight systems, Chinese poles, Olympic trampoline with harness, mini tramp and crash mats, hybrid circus aerial apparatus, silks, web rope, corde lise, straps, floor mats and fitness training equipment Drapes and backdrops. An internationally acclaimed aerial theatre company. Co-founder of The Lab and head rigger, film & television stunt performer, creative rigging designer and aerial equipment engineer. 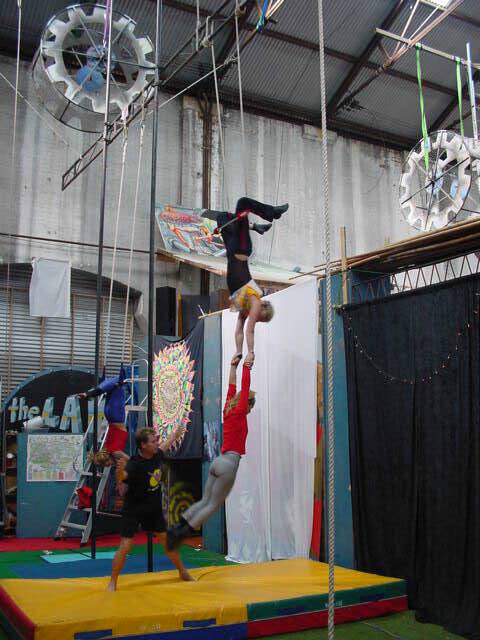 Aerial trainer, rigger, ex Circus Oz aerialist/performer, film & television stunt performer. Aerial trainer, ex Flying Fruit Fly, Circus Oz and Acrobat. Sydney¼s circus equipment bazaar, providing custom made stilts, fire & juggling equipment to leading theatre companies and schools. Martie J produces high quality costumes for numerous theatre companies and worked extensively on the Opening and Closing Ceremonies for The Sydney 2000 Olympic Games. Claire Millidge an acclaimed local artist provides finished art, backdrops, banners and body art for performing artists and groups. CircusWorks and The Lab also provide communal facilities for independent performers and artists such as sewing machines, workshop space/equipment, audio/video production and storage facilities. As a training facility, the Lab is already well recognized. With the assistance of major funding, the Lab with its foundations within the local and international circus and performing arts community, has the potential of becoming a major part of Australian performing arts culture and history. 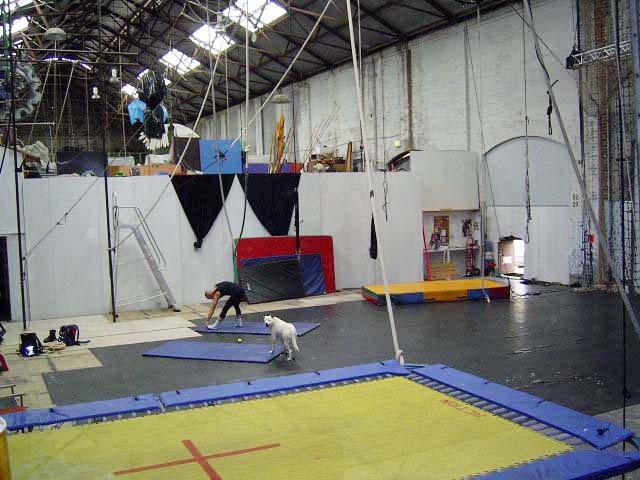 The immediate vision is for the expansion of existing space as a testing ground for a more permanent facility... to provide more floor space and to include a flying trapeze rig, stunt flying rail [ie matrix/crouching tiger], tumbling run, climbing structures, expanded trapeze and floor facilities and an administration infrastructure - the future vision is The Lab as a permanent circus training facility to be included in the Ministry of the Arts planned establishment of an arts precinct here at the Wilson Street Carriageworks - This facility would cater for professionals in the industry [performers and trainers], individuals and groups seeking training. Expressions of interest and support in establishing a permanent Sydney Institute of Circus Arts: The Lab has the support of groups like Circus Oz, Circus Monoxide, The National Circus Festival, Enmore Tafe [they have expressed interest in providing administration and academic facilities for a diploma syllabus], CircusWorks, Sydney Aerial Theatre Association and the circus community as a whole. The Lab has also received acknowledgement from groups like SOCOG, Les Arts Sauts, Theatre du Soleil and Cirque Du Soleil for the level of professionalism displayed in the existing function and form of The Lab. CircusWorks and The Lab acknowledge the special assistance Company B and State Rail has given the performing arts community in providing such a unique creative space.